Perfect Location, walk to Downtown Dunedin! Comfortable first floor living in this spacious one bedroom unit with ample closet space, washer and dryer, and all new modern and functional décor, including 2 HD Smart TVs. The gated community offers beautifully landscaped grounds with waterfalls, clubhouse with an exercise facility and a lovely shaded pool. This beach themed unit has a fully equipped kitchen with maple cabinets and granite counter tops. The location is perfect! Walk or bike to lovely downtown Dunedin and enjoy the quaint shops, local breweries, wonderful restaurants, art galleries and parks. There is always something going on downtown, from festivals to live music. Friday and Saturday mornings visit the local Farmers Market located in the downtown square. The sunset over the Gulf of Mexico is always amazing while you have dinner at the waterfront Marina. The 39 mile biking or walking, Pinellas Trail, runs thru the heart of Dunedin. Three incredible beaches are all within a few miles of the condo. Our guests will enjoy the use of two ten speed bicycles, helmets & locks. There is also beach chairs, beach towels and a cooler plus an Annual Family Pass to all Florida State Parks which is provided for your enjoyment. Caladesi Island and Honeymoon Island are located just over the causeway. Caladesi Island was voted as one of Americas top ten Best Beaches in 2017 by Forbes. And only 7 miles to beautiful Clearwater Beach. Baseball fans can walk over to the Toronto Blue Jays spring training site located just three blocks away and watch a game. We just purchased this beautiful condo because we love Dunedin and all it has to offer. We currently live in Columbus Ohio where we both grew up. We hope to retire in Dunedin. In the mean time we decided to use it as a rental when we can't be there. We have included everything that we enjoy while we are there for out guests to use. Our condo is conveniently located in the heart of Dunedin where you can walk to Downtown, the Marina or the Pinellas Trail. Its been completely updated and furnished in a fun beach decor. Walk to wonderful Downtown Dunedin! Walk right down the street to the ocean! Full set of Hard Anodized Cookware, baking sheets, casserole dishes, mixing bowls, hand mixer, Bullet blender, plastic storage bowls, dishes, glassware, silverware, cooking utensils, pot holders. Granite countertops, maple cabinets, ceramic tile flooring. We stayed in this beautiful condo for two months this winter. The location was great! Only a few blocks for the bike trail and the cozy little main street of Dunedin. The condo had everything you could possibly need to make your stay complete. The owner had bikes, helmets, beach chairs and towels. The kitchen was fully stocked with everything you could need to either cook in or grill on the new grill close to the pool. I would say the location of the unit was the best in the whole complex. It was situated in the rear of the property with the patio facing the sun every morning. We had coffee and read the paper outside every day. The owner has a pass to the state park system in Florida which is a big bonus! We spent many days walking and sitting in the sun on Honeymoon Island. I only had to contact the owner a couple of times during our visit (the complex had some plumbing updates while we were there, which only took about an hour to complete and I wanted to let her know it was done) and each time she responded quickly. I would recommend this rental 100%!!!! It was great! Thanks Laura for a wonderful winter!!! We loved everything about this place! The condo is in a very pleasant development, very convenient to all the amenities of charming Dunedin (Pinellas Trail, Dunedin Marina, parks, farmers' market, restaurants, breweries and shops) and the surrounding area. It is tastefully decorated in a beach theme, is so comfortable, clean and very well-equipped. Laura, the owner, is a great communicator and made sure that everything was just as described. We especially appreciated the use of the good bikes and the pass to the gem of Honeymoon Island, which has unspoiled beaches and hiking trails. We're grateful to our hosts and would love to return! We are so glad you enjoyed your stay. Thank you so much for the kind words and excellent review. We truly appreciate you and the care you took of our condo. The condo is attractive, very comfortable and an easy walk to Main Street or bike ride to several towns or beaches. The bed is very comfortable with plenty of fluffy pillows. The kitchen is small but well stocked w pots, pans, bowls, knives and dishes. We cooked many meals here, enjoying the wide variety of food choices from Publix and Fresh Market. It is easy to maintain while living there. The condo is on the first floor, and because the parking is right outside the patio door, it was very easy to bring in groceries or beach equipment. The condo is equipped w two good bikes, locks, and helmets, which is great with the Pinellas bike path so close by. It also includes two beach chairs, a good sized cooler and a beach bag for all your trips to the many local beaches. We enjoyed the tree-shaded pool a few times, especially because no one else was there. If you are interested in the fitness center, forget it, typical of some condos, it had an ancient mechanical elliptical, a broken tred mill and an ancient Chuck Norris type bow flex with no instuctions on how to use (and it was not obvious) It had some small weights. This was the one disappointment. Otherwise, the maintenance man was pleasant and I assume he would help out if we had an issue. He did a good job maintaining the property. More importantly, the owner of this condo was fabulous and immediately responded to all our questions or concerns. She was a pleasure! The town of Dunedin has several good beaches, restaurants, bars and cultural locations. Honeymoon State Park, Sand Key Park in Clearwater are both favorites. I recommend this rental, for its comfort, amenities and location. We loved it there and would love to return. Thank you for the nice review. We are so glad that you enjoyed the condo and had a great time. We would love for you to come back anytime. My husband and I stayed here for the month of April 2018. What a beautiful place. Looks even better in person than the pictures show. The place was spotless, bright and airy, very safe, the bed was extremely comfortable, the condo was fully stocked with everything and anything you would need, and Laura was a wonderful host and truly a pleasure to work with. The location was so close to the Honeymoon Island State Park which is one of the most beautiful beaches in Clearwater, FL and there is a beach pass included when renting the condo. You can take in the breathtaking views of the sunset every evening by just walking down to the end of Lyndhurst Street where the condo is located or by riding the two bicycles that are available at the condo. Also, there are so many fine restaurants and shops all located within walking distance of the condo. The price for renting this condo cannot be beat. We have stayed many places in Florida and this was by far the very best of the best. 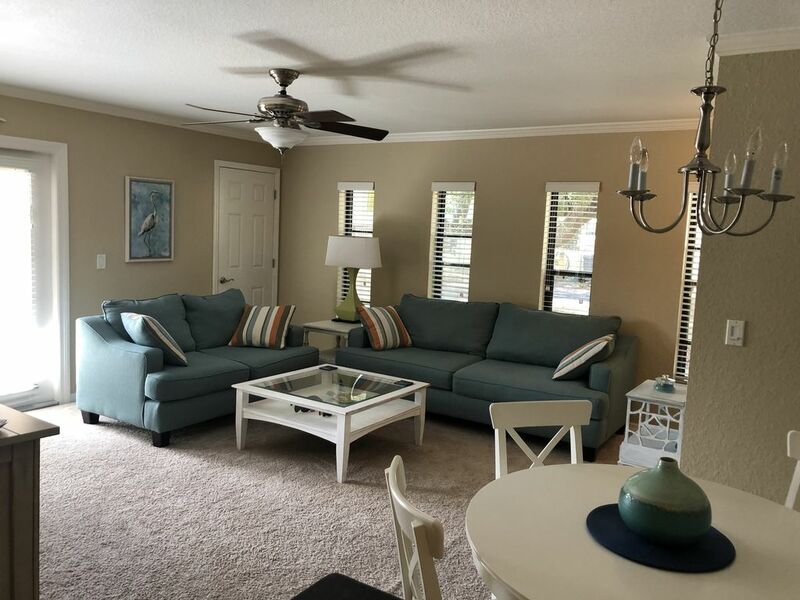 We recommend renting this condo to anyone who is looking for a clean, quiet, comfortable and safe place to stay while on vacation in the Clearwater/Dunedin Florida area. You will not be disappointed! Thank you for your wonderful review and for taking care of the condo as if it were your own! We are so glad you enjoyed your stay! This condo we rented was beautifully decorated, very clean and walking distance to downtown beautiful Dunedin! The condo had everything you needed and if you did need anything, Laura got it right away! She is an awesome host! Always there to ensure you had a great stay! I would recommend this condo to everyone! Was sad to leave! Fantastic place, friendly people in surrounding condos! We are so glad you enjoyed your stay! You both were wonderful and took such good care of the condo. We hope you come back again! My husband and I truly enjoyed our stay at the condo. It had everything we needed and felt very much at home. There were additional amenities such as two bikes, beach chairs, cooler bag, in-suite laundry, private balcony and a full kitchen. The coastal condo furnishings were modern, beautiful and so comfortable; the condo was impeccably clean. The location is a short drive to Clearwater Beach. We walked 10 minutes to downtown Dunedin or a quick bike ride; and five blocks to the Blue Jays Spring Training Camp where we took in a game - what an experience! We enjoyed the extensive bike/walking trail. The homes in the area have a key West feel - small cottage-like, lush with plants and trees, whimsical and some streets with cobble stoned. Laura was quickly available to answer any question or concern that came up. We felt very safe in the gated complex. The other tenants/guests were friendly. The pool was not opened however, there was more than enough for us to enjoy during our stay and we really didn't want to leave after our month stay! We hope to return to this same place next year. We have fallen in love with Dunedin!! We are extremely happy that you had a comfortable and enjoyable stay at our condo. Thank you for treating our condo like it was your own. We would love for you to come back anytime!